Some genetic mutations linked to sudden cardiac death are known to affect a certain part of sodium channels, the proteins responsible for letting sodium ions into cells. 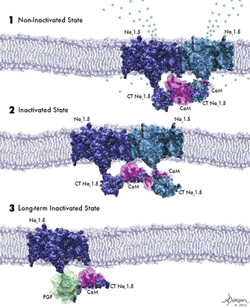 Researchers found the effect of these mutations on the interaction between sodium channels and another protein, calmodulin, which regulates the channels’ opening. Discovery suggests a starting point for designing drugs to prevent sudden cardiac death. Caption: (1) Two activated sodium channels embedded in the cell membrane are bound to each other and to a calmodulin molecule (purple). (2) Sodium channels bound to each other and to calmodulin are poised for activation but have not yet been opened by voltage change. (3) A sodium channel not bound to another channel cannot be activated by a voltage change. For years, a multidisciplinary team of Johns Hopkins researchers has tracked an elusive creature, a complex of proteins thought to be at fault in some cases of sudden cardiac death. As they report Nov. 5 in the online edition of Nature Communications, they have finally captured images of the complex. Those images reveal the connection between some genetic mutations and electrical abnormalities of the heart and provide a starting point for designing therapies. The genetic studies were a hint that many cases of sudden cardiac death might come down to faulty interactions between sodium channels and calmodulin, which in turn would lead to electrical misfires. In that case, perhaps a drug could be designed that would correct the interaction. But finding such a drug would be a shot in the dark unless researchers could figure out what the sodium channel-calmodulin complex looked like — and how the mutations were affecting it. Tomaselli’s research group teamed with those of L. Mario Amzel, Ph.D., a professor of biophysics and biophysical chemistry, and Sandra Gabelli, Ph.D., an assistant professor of medicine and of biophysics and biophysical chemistry, to try to figure out the structure of the complex and how changes to it affect muscles’ electrical properties. To learn that, the researchers had to coax bacterial cells to make human versions of sodium channel proteins and calmodulin, purify the protein complexes, and image them with a technique called X-ray crystallography. “We observed that binding to calmodulin changes the state of the sodium channel, leaving it poised to be activated, or opened, by an electrical signal from outside the cell,” Gabelli says. The researchers also tested the electrical properties of cells with normal and mutated versions of the sodium channel-calmodulin complex. They found that the latter corresponded with EKG readings of people with long QT and Brugada syndromes. “Altering calmodulin regulation of sodium channels may be an important and novel therapeutic strategy for the treatment of heart failure, arrhythmias, neurological disorders, such as seizures and autism, and diseases of skeletal muscle,” Tomaselli says. Other authors on the paper are Agedi Boto, Victoria Halperin Kuhns, Mario A. Bianchet, Federica Farinelli, Srinivas Aripirala and Jesse Yoder, all of The Johns Hopkins University, and Jean Jakoncic of Brookhaven National Laboratory. This study was funded by the National Heart, Lung and Blood Institute (grant number HL050411).